To open the sunglasses holder, push and release the indent. To close, push it again until it latches. You can store eyeglasses and other small items in this holder. 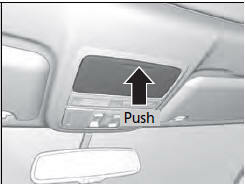 Keep the holder closed while driving except when accessing stored items.